In the 1960’s, with a heart condition, my grandfather retired to Florida — today he probably would have had bypass surgery and continue to work. After my grandmother died he set up a studio in his garage and taught himself to paint. So I was surprised to find this article from Boot and Shoe Recorder Magazine. 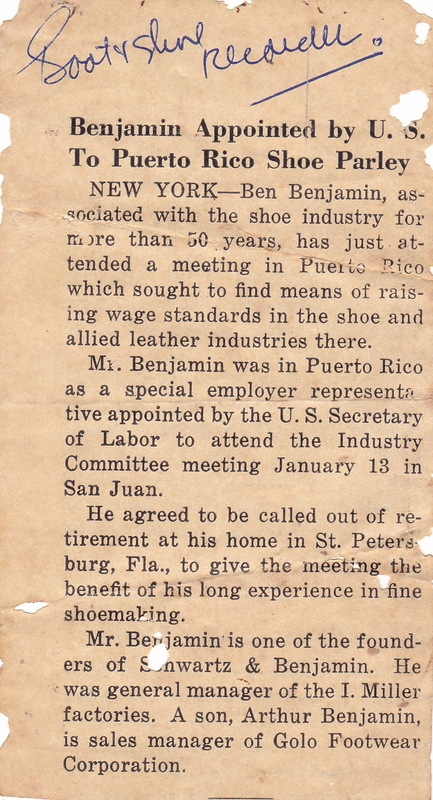 After some reading about labor relations and Puerto Rico I think it may have been around 1962 – 1963. Boot and Shoe Recorder. Date unknown. I never knew that about Grandpa going to Puerto Rico, did you? Fascinating. Isn’t it? I don’t remember him ever mentioning it. You are currently reading Another Mystery at Women's Footwear in America.